Pretty neat tattoo. I actually couldn’t bring myself to incorrectly spell the title of this post. I promise no more Kitty posts tonight…. Cybertecture: I Want One Of These Mirrors In Every Room Of My House! Maybe I can re-mortgage my house to get it? The Cybertecture mirror will be available for pre-order this December and will apparently start shipping in Spring 2011, it’s an internet connected interactive mirror, and it’s one of those I don’t need it but I really want it items. I can’t see anything on the actual website that mentions that it runs Android but they have a page of press articles about it and the Wall Street Journal Article mentions it as does but the Engadget article seems to say that it doesn’t I’m inclined to think Engadget are probably right, it looks cool but it looks nothing like Android. I can’t say I’m surprised, SyFy Have decided to can the Battlestar Galactica Sequel Caprica. Hopefully they will plough the resources that they would have spent on it on making Blood and Chrome as awesome as it can be. Caprica was a bit incoherent, it started with a fairly good premise but I think it got lost and just didn’t go anywhere. 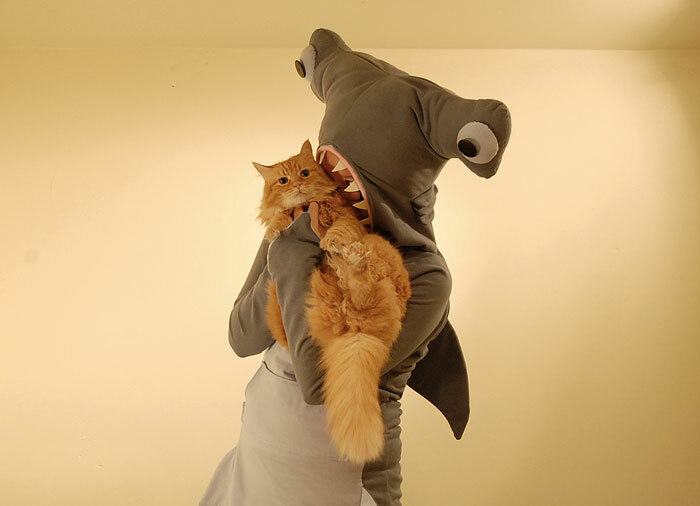 I don’t know where this image came from I found it while randomly browsing livejournal but it is made of awesome, it has a bemused cat in it and a woman in a hammerhead shark suit, what more could you ask for. The two kittens in this video have Myotonia Congenita also known as “Fainting Goat Syndrome” when they get spooked by a loud noise they faint and are paralysed for a minute or so. The expression of confusion on their faces is heartbreaking. Recycled bike frame fence, originally uploaded by akm_2_go. 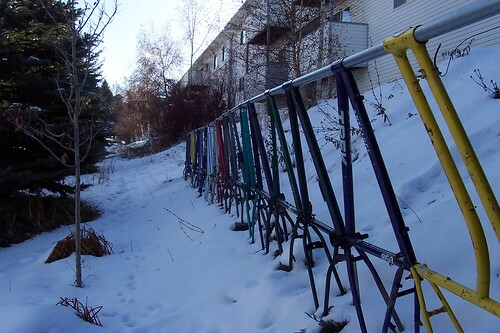 This is a great idea, apparently it was created to stop erosion caused by people riding their bikes down the hill. Did they just confiscate all their bikes and use them to make the fence?